Lately I noticed that I have become a slave to notifications. I can’t leave the inbox full. I must see what notifications I have on Facebook and Instagram. This is not healthy. Low and behold I open my inbox and see the devotional below. Talk about a coconut. Enjoy! The very fact that we have a field of science dedicated to interruption is evidence of how bad noise has gotten in our world. Consider this: For the past 30-plus years, an acoustic ecologist named Gordon Hempton has compiled what he calls “The List of the Last Great Quiet Places.” It consists of places with at least 15 minutes of uninterrupted quiet during daylight hours. At last count there were only 12 quiet places in the entire United States! And we wonder why the soul suffers. It’s hard to tune out the voices of others, the call of social media, and the constant demands to do more and be more. 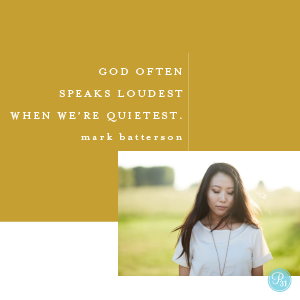 But silence helps us hear God’s voice and sing His song. Silence is the difference between fear and faith. Have you ever tried to quiet a loud room? Attempting to yell above the crowd usually doesn’t work. It’s far more effective to hush the crowd with a shhh. That’s the method God employs. His whisper quiets us, calms us, stills us. As we see in today’s key verse, “He says, ‘Be still, and know that I am God’” (Psalm 46:10a). The “white noise” of the world might be the greatest impediment to our spiritual growth. By definition, white noise is a sound that contains every frequency a human can hear. And because it contains every frequency, it’s very difficult to hear any frequency — especially the still, small voice of God. When our lives get loud, with noise filling every frequency, we lose our sense of being. When our schedules get busy, we lose our sense of balance, which is a function of the inner ear. Can I go out on a limb? Your life is too loud. That’s how we forget that God is God. And it takes very little to distract us. “I neglect God and his angels, for the noise of a fly,” said the English poet John Donne. Over the past decade, I’ve recorded a dozen audiobooks with a brilliant sound engineer named Brad Smiley. During our last recording session, Brad told me about standard operating procedure for sound mixers in his industry. Before going into the studio, they let their ears relax and recalibrate through absolute silence. Only then are they ready to listen, really listen. Acoustic ecologists call the process ear cleaning. If you want to hear the heart of God, silence is key. If you want the Spirit of God to fill you, be still. The psalmists referred to God as their refuge, their fortress, and their ever-present help in time of need. But my favorite descriptor might be the “hiding place.” “You are my hiding place; you will protect me from trouble and surround me with songs of deliverance” (Psalm 32:7, NIV). The voice can reproduce only what the ear can hear. My prayer is that you’ll learn to discern God’s voice. When you do, His songs of deliverance can set you free. Lord, I want to hear Your whispers louder than the noise of the world surrounding me. What do You want to say to me today? In Jesus’ Name, Amen.